An unaltered photocopy of your WD AGO 53-55 or other military issued document clearly displaying your award of the Occupation Service Medal - Army, Navy, Marine. Contact The War Library if you do not have a WD AGO 53-55: 1-562-422-4100 (Pacific Time Zone). Don't forget to include an unaltered COPY of your WD AGO 53-55 or other pre-arranged document(s). 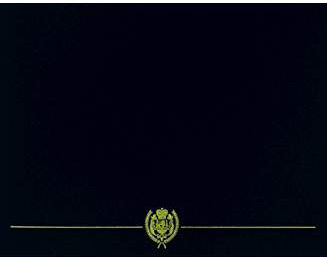 The Army of Occupation Medal was established by War Department General Orders Number 32 (1946). The Army of Occupation Medal was awarded for military service of thirty or more consecutive days of duty in one of the occupied territories after World War II. The Army of Occupation Medal is worn after the World War II Victory Medal and before the Medal for Humane Action. Two clasps were authorized for wear on the suspension ribbon to the Army of Occupation Medal: GERMANY and JAPAN. The Berlin Airlift Device (a gilt C-54 aircraft with a 3/8 inch wingspan). This device is worn with the aircraft's nose pointed upward at a thirty degree angle toward the wearer's right shoulder. It was given for ninety or more consecutive days service between June 26, 1948, and September 30, 1949, while assigned or attached to a unit participating in the Berlin Airlift. The Army of Occupation Medal was designed by Thomas Hudson Jones (1892-1969). The first Army of Occupation Medal was presented to General Dwight D. Eisenhower on April 2, 1947; the second was forwarded on April 2, 1947, to General Douglas MacArthur. In the center of a bronze medallion one and a quarter inches in diameter, a bridge is shown with its towers to the viewer's left (the bridge itself extends to the right rim of the medal). Above the bridge, in two lines, are the words ARMY OF / OCCUPATION. The bridge was the Ludendorff railroad bridge at Remagen, Germany and was situated 22 miles northwest of Koblenz. On March 7, 1945, the Allies established their first bridgehead across the Rhine by seizing the Ludendorff railroad bridge at Remagen before the Germans could destroy it. Since this bridge was "point of entry" of ground forced into Germany, it was selected to represent the occupation of Germany. In the center of a bronze medallion one and a quarter inches in diameter, two Japanese fishing boats are depicted in full sail in front of a volcano. The date 1945 appears in the exergue. The scene portrayed on the reverse is Fujiyama, an extinct volcano in south central Honshu, Shizuoka Prefecture, 70 miles southwest of Tokyo. It is the highest peak in Japan. The two boats are sailing on one of the five small lakes at the base of Fujiyama. This scene is symbolic of Japan, or the Army of Occupation in Asia. The date denotes the beginning year of the Army of Occupation. The ribbon to Army of Occupation Medal consists of equal portion of red and black with white edge stripes. The colors are taken from the American Campaign Medal, where they appear as pinstripes inside each edge. The red and white represent Japan and the black and white represent Germany, the primary opponents of the United States during the Second World War, and the primary countries occupied after the war. The Army of Occupation of Germany Medal was established by Act of Congress (Public Law 322, 77th Congress) on November 21, 1941. The Army of Occupation of Germany Medal commemorates military service in the occupation of Germany after the First World War. It was awarded to members of the Armed Forces for service with the occupation forces in Germany or Austria-Hungary between November 12, 1918, and July 11, 1923. For members of the Army, the Army of Occupation of Germany Medal takes precedence after the World War I Victory Medal and before the American Defense Service Medal. For members of the Navy, it takes precedence after the World War I Victory Medal and before the Second Haitian Campaign Medal. No devices were authorized for this medal. The Army of Occupation of Germany Medal was designed by Trygve A. Rovelstand. The first award of the Army of Occupation of Germany Medal was made to General John J. Pershing. In the center of a bronze medallion one and a quarter inches in diameter, a profile of General of the Armies John J. Pershing. Around the upper edge are four five-pointed stars and to the left of the profile, the words GENERAL JOHN J. PERSHING. To the right of the profile is an unsheathed sword, point up, within a laurel wreath, and the dates 1918 and 1923. The profile of General Pershing was selected because he was the Commander of the Allied Expeditionary Forces in the First World War and the four stars refer to his rank. The sword represents military strength, the laurel wreath alludes to victory, and the dates are the years of the occupation of Germany after the First World War. In the center of a bronze medallion one and a quarter inches in diameter, an eagle with wings outstretched is shown perched over a castle and is encircled by the inscription ARMY OF OCCUPATION OF GERMANY. Three five-pointed stars appear at the six o'clock position and each word in the inscription is separated by a bullet. The eagle is the American bald eagle and represents the United States. The eagle is perched over Castle Ehrenbreitstein, which is located in Koblenz. The eagle over the castle symbolizes the American occupation. Koblenz is where the Rhein and Mosel Rivers meet and is symbolically the gateway to Germany. The three stars represent the number of Armies in the occupation. The ribbon to the Army of Occupation of Germany Medal consists of a central stripe of black flanked by narrower stripes of white. It is edged with blue and white pinstripes, the blue pinstripe forming the edgestripes of the ribbon. The black and white stripes are the colors of Prussia and represent Germany; the blue, white and red stripes represent the United States. In April of 1942 the Secretary of War approved the design of the ribbon, in which outside stripe (blue) was to be "scalloped," and a quantity of that ribbon was produced. However, in July of 1942 further manufacture of this ribbon was suspended, and in September of 1942 the ribbon design with a straight blue edge was approved by the Secretary of War. As final approval of the complete medal was not secured until March 23, 1943, none of them were ever officially fitted with the "original" ribbon. 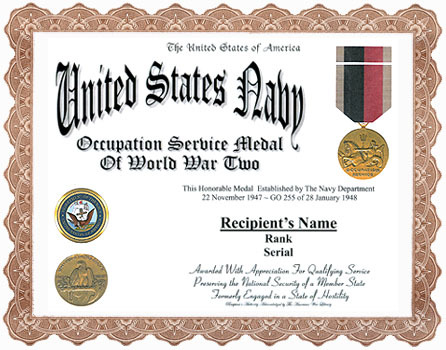 Established by the War Department in 1946 and awarded to members of the US Army and Air Force for thirty days or more consecutive service in the Occupation Forces.